The euro vs dollar continued to exhibit further bullish momentum yesterday albeit in a muted way, probing the USD1.3107 level before falling back and closing marginally lower at USD1.3076. This morning’s price action again has been muted and a continuation of the minor pullback but still well above all three shorter term moving averages and, more importantly, holding above the 9 day moving average. Whilst the technical picture remains in its current state the short term outlook remains bullish but as we run towards USD1.3250 and beyond the pair will increasingly encounter still opposition to the upwards momentum and coupled with the 200 day moving average at the USD1.3500 level, these factors will probably combine to cap the extent of the current rally. At this point, or sooner, the price action will reverse and the longer term bear trend will be re-established as a result with a move lower to re-test USD1.18 in due course. 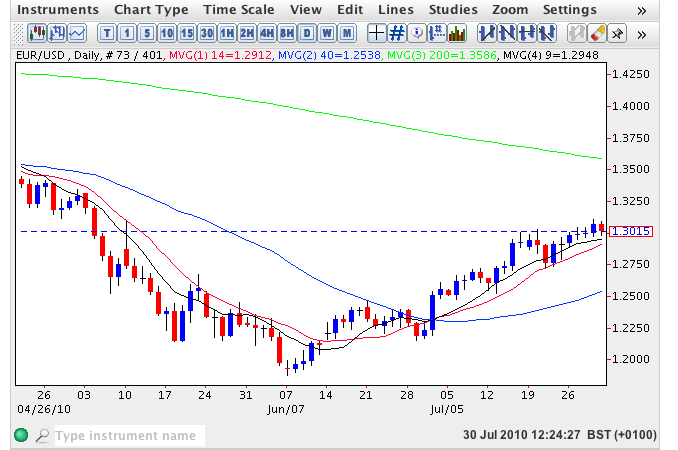 All the fundamental news for the euro vs dollar can now be found on my main forex trading site.